Piers Morgan’s much trumpeted (and subsequently much criticised) recent interview with Donald Trump was remarkable for a number of reasons. In the first place, it represented the first time that the President had been interviewed on British television and for that reason alone the meeting was greatly anticipated. 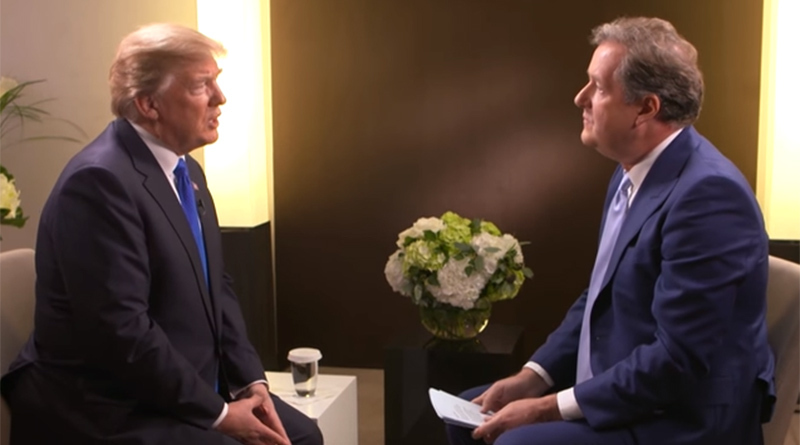 That said, given the closeness of the relationship between Trump and Morgan, it’s true to say that no one was seriously expecting the interview be anything other than the festival of flattery that it turned out to be. Trump was, as usual, triumphalist, vague, self-congratulatory and repetitive. “The art of the political interview, Piers, is to push your interviewee hard – not let them spout self-evident tosh. That’s just showbiz”. The art of the political interview, Piers, is to push your interviewee hard – not let them spout self-evident tosh. That's just showbiz. Simpson’s reference to the “art of the political interview” is interesting and the subtext of a great deal of the criticism that Morgan received was to do with the notion that he had somehow degraded the sacred act of confrontational discussion. During the 1990’s it was indeed Paxman who adopted Day’s mantle as he quickly gained a reputation for fearlessness and an unwillingness to be charmed by the fripperies of modern politics. In 1997, in perhaps the most infamous exchange in modern politics, Paxman interviewed the then Home Secretary, Michael Howard in a style that was both laconic and relentless. After asking Howard if he had ever lied in any public statement, Paxman then went on to ask the same question twelve times. But along with the perceived aggression and suspicion Paxman, like Day before him, was actually fiercely intelligent – a skilled political operator who was well briefed and quite capable of thinking on his feet. In this sense of course, Paxman, Humphrys, Laura Kuenssberg and the like fulfil journalism’s vital democratic function in holding truth to power by asking the questions that the electorate cannot directly ask. In saying that, viewing the Howard interview footage some 21 years later what you see is undoubtedly political theatre but it also rather sad and frustrating. Here are two capable people reduced to playground posturing. Nothing is resolved, by the way, Howard doesn’t answer the question and Paxman stops asking it. Democracy was therefore ill served by an episode that added nothing to the political process beyond the visceral thrill of watching two alpha males lock horns. Which was perhaps the point of Evan Davis, who, in 2015 stated that the interviewing styles of Paxman and Humphry’s were “overdone”, “worn out” and “not a particular public service”. Davis and Katz seem to agree that what’s needed in this multimedia digital age is a recognition by both politician and journalist that the interview must yield something useful beyond the spectacle itself. Finding this common ground is arguably more pressing for conventional journalism than it is for politicians. As Trump has shown, social media means politicians now have unprecedented opportunities to bypass the traditional channels of communication. Over 47 million people follow Trump on Twitter and via the site he can speak to the world continuously and without apparent censure. Many have taken the time to analyse his language, but his motives are clear. As I’ve written before, social media means Trump can behave like the showbiz star he really is and cut out the troublesome middleman to promote himself and his policies without the inconvenience of long-form explanation. Day after day we see evidence of the value Trump places in bypassing the “crooked” mainstream media to speak directly to his base support in a language he thinks they understand. He really doesn’t need to do what politicians have traditionally done. So when Trump agrees to meet Piers Morgan, in his only “international” interview, it’s bound to be entertainment and not political journalism. That’s not to say we shouldn’t have wished for more, of course. But given that Trump follows only 45 people on Twitter and the only British person he follows is, you’ve guessed it, Piers Morgan – then that was always going to be a forlorn hope.